At least, not to God. One year ago I spent a weekend at camp with seven middle school students – my Confirmation class from church. We immersed ourselves in Jesus – His words, His actions, His life experiences – and we ended the weekend with a service of worship. Those of you who work with youth will agree that it takes a great deal of faith in the Spirit of God to allow teenagers to design and lead worship for adults. Something (SomeONE) told me, in my preparations for this end-of-the-year event, that I needed to trust Him and give the students lots of wiggle room as they planned to lead worship on Sunday morning, for their parents and mentors. We began on Friday night by agreeing that we would not do anything in our worship service that wasn’t meaningful to us, and we proceeded to create a time of communal worship to reflect God’s presence and activity in each of our lives. One student wrote two prayers for worship (“God, at camp we went outside and looked at the stars. We were supposed to whisper a prayer, then we were supposed to yell a prayer. I yelled that You are so amazing!”). Another student connected with the scriptures and found several passages that she read aloud, and we selected songs to go with each. Three students experienced God’s presence in a particular Station of the Cross, and they worked together to share not only the words of the Station, but their personal reflections and feelings about it as well. Two students remembered Jesus’ words at the last supper and shared these with us as we prepared to commune with Him over grapes and crackers. We built in time for hugs and handshakes and conversation about God’s Word, and we set aside time for a student to tell jokes (because laughing out loud made these students feel closer to God). What emerged from their honest efforts to connect with each other in the presence of God was true, Spirit-empowered worship. The kind of worship God seeks from you and me. No matter how sincerely we attempt to worship God from deep within ourselves – from our God-created spirit-nature – the only way we can do this is by the power of God’s Spirit. He is the influence that breathes pneuma into our otherwise physical existence. It is only by the power of His Spirit working within us that we stand a chance of being the kind of worshipers God is actively searching for today. Animated by the pneuma of God, we find a fluidity to our worship that simply flows from who He is into who we are, both as individuals and as a community of faith. This is what happened at camp last weekend, when we let God lead us into His presence (rather than creating a worship form and then trying to make God fit inside). Strong’s Greek Lexicon describes the word alētheia (truth) as“that candour of mind which is free from affection, pretense, simulation, falsehood, deceit.” When we do the faithful work of separating from the influences of the fallen world we live in, we find ourselves free from the fiction that our culture exalts as truth. We find the ability to unbuckle ourselves from the simulators and strip away the obligatory social/political correctness, releasing us to enter into unadulterated worship of the God who sees our true selves and longs for us to see Him, too. As He really is. Interested in music created in celebration of TRUTH and COMMUNITY? Check out the two-woman band, Alathea. Every now and then, we miss the point. Every now and then, we get too focused on the shoes and we simply miss the point. After my first blog post, just over one week ago, I ran into a friend who had read “My Pink Shoes” and had left an amazingly encouraging comment in response. And the first thing she did was look down at my feet. I was wearing black flip flops. She was disappointed – I could see it in her eyes – and I was at once both amused and dismayed. She read my blog (I smiled)! She connected with the shoes (I knew she would)! But… the shoes aren’t the point (just the touch-point)! The shoes are the symbol (not the substance)! What have I done (did I mislead her)? IT ISN’T ALL ABOUT THE SHOES! And YOU’RE RIGHT – this happens. Proof is everywhere. All you need to do is look around. Accessorizing with the Christian faith, however, is a dangerous thing to do. For this believer, the time has come to think outside the shoe box! Opting to walk away from the need to choose my own spiritual “accessories,” I open up my life to the possibility that what God has in store for me to put on today may not even FIT into a box at all! 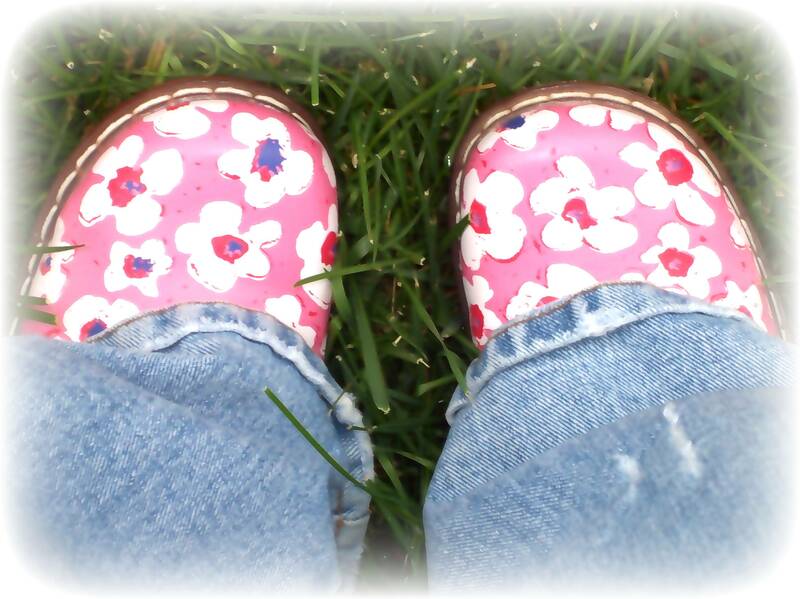 The spiritual equivalent of wearing my pink shoes all day, everyday, is to yield to the character of the living, active Spirit of God who makes His home inside plain old, little old, unimpressive ME. I hope you run into me soon, my friends, and when you do, please don’t bother with my feet… LOOK UP! I’ll be wearing my pink shoes in my heart, where they most assuredly belong. Just a few of the Tuesday girls! 13 women armed with coffee cups (correction: 12 coffee cups, one tea cup) and Bibles were once again hijacked by the Holy Spirit. This phenomenon, happening with increasing frequency, takes the entire circle of women in my living room on one WILD ride through a full range of emotions and subjects and stories that would make the faint of heart… well, FAINT. Don’t get me wrong! 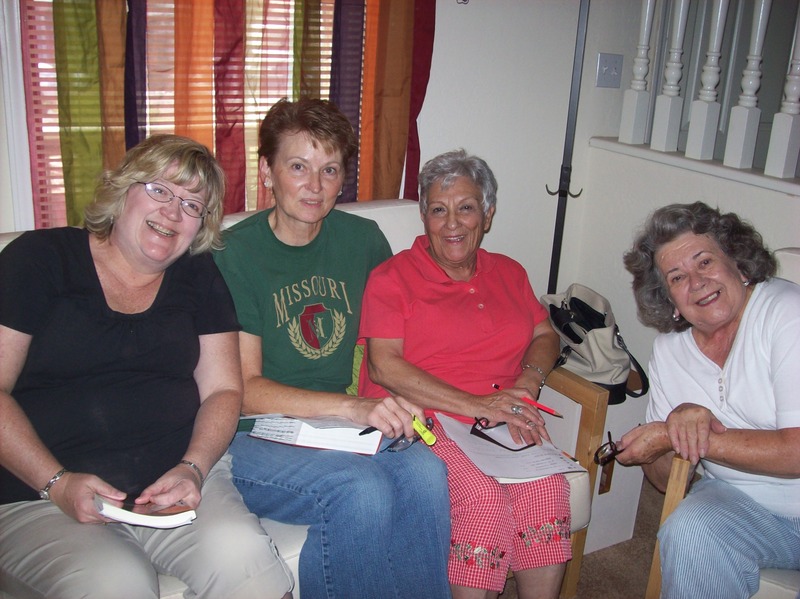 We come into each session with a shared objective – to cover the assigned material of our current study – but as the conversation begins and the very real needs of the group emerge, our agenda is often hijacked for a GREATER ONE. Sometimes there are CONFLICTS that need to be resolved, or at least understood so that we can move on (strained relationships with difficult family members; run-ins with people who try to derail our attempts at loving those on the fringes; threats made by our own selfish nature that are at war with the Spirit of generosity God wants to fill us with). Sometimes there is COMFORT that needs to be shared (when we’re losing our homes to the bank; losing our kids to addictions; losing our minds to menopause; losing our loved ones to cancer; losing our focus to the mind-numbing busy-ness and noise of the world around us). This week’s hijacking was marked by TEARS, answered (and unanswered) QUESTIONS, hysterical GIGGLING and moments of awkward SILENCE. Climbing off of the ride and into the study at hand, we realized almost simultaneously that what we had already experienced/wrestled with/discussed WAS the topic of this week’s chapter. The “lesson” had begun – it just looked so much like our real lives that we hadn’t even noticed. It’s even a bit UNNERVING! But go ahead – give up your NORMAL for His distinctively COUNTER-CULTURAL and make like a Girl Scout (be PREPARED)! A Spiritual hijacking is coming your way, and it has YOUR NAME written all over it. Special thanks to Barbie, a Tuesday morning gem, who used this phrase to describe our women’s group to a friend. I saw these shoes, and I’ll admit to you that there was only a hint of attraction when I picked them up to show my daughter; it was her reaction to them that made the sale. The word hideous was used, and I remember a comment about “not being seen in public” with me before she put up her hand, turned on her heel, and walked away. How could I RESIST? Of COURSE I bought them! These shoes have stirred up emotions and sparked lively conversations over the years. One friend wrote a sappy poem about them while another conspired with my daughter to make them “disappear” while I was on a trip out of town. Even when they are tucked safely away in my closet, threats of a one-way trip to Goodwill have been made by both family and friends. I’ve also found I can’t blend in with a crowd while these beauties are on my feet. They make a STATEMENT when I wear them, in a language all their own; not unlike what happened in Jerusalem, at Pentecost (Acts ch. 2). When God unleashed His Spirit on Jesus’ followers that day, He made them STAND OUT! What else could the tongues of fire have been for? They certainly weren’t going to “fit in” with any crowd while flames erupted on their heads! God’s invitation to His followers at Pentecost was clearly NOT to a life of predictability and status quo. When His Spirit comes in power to willing disciples, PEOPLE TAKE NOTICE! In just one day at Pentecost, about 3,000 onlookers witnessed the unusual events, felt the power of the Spirit of God, and responded by putting their faith in Him. THIS I BELIEVE – just look at me! I sit at my computer today, a willing disciple of the risen LORD (pink shoes notwithstanding), and while you probably won’t believe that there are flames of fire on my head, I promise that those flames ARE HERE, in my HEART. I feel something like a Galilean these days, because although I’m equipped with a head (somewhat) filled with knowledge, I’m not formally “schooled” in religion – I’m simply a follower of Yeshua, like the first disciples were. An unlikely candidate to deliver a message that might affect, or even change, the world. Yet the Spirit of God comes in power to set apart the lives of those who yield to Him. We are MARKED by His glorious presence. We are CLAIMED by the God who created and breathed life into us. We are EMPOWERED to DO, in Jesus’ own words, even greater works than His own (John 14:12), putting God’s glory on display for all to see. In the process of all of this marking, claiming and empowering, as with the disciples at Pentecost, these lives we live are changed. Gone are the days of getting lost in the crowd; instead, let’s wear our uniqueness like a pair of pink shoes while the fire of God’s truth burns brightly in our hearts. "Let's wear our uniqueness like a pair of pink shoes..."